Rule all of ancient Egypt aside one of the most infamous females in history. Click here to play! 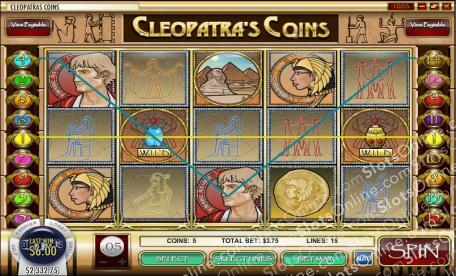 Join Cleopatra as she charms the leaders of the Roman Empire and controls the vast golden lands of Egypt. You will find yourself collecting plenty of ancient treasure! The Scarab is a sacred symbol in Cleopatra's kingdom. Spin two to five of these golden, jeweled beetles and you could get up to 5000 times your line bet. But it is particularly special because it acts as a wild symbol and will substitute for all other symbols (except scatters and bonuses) to help you create more winning combinations. You'll also want to watch out for the Romans. If you spin three to five Caesar symbols and you'll get up to 300 times your line bet. Three to five Marc Antony symbols will get up to 350 times your bet. Cleopatra, pyramids and hieroglyphics will also bring in plenty of wins. Ruling a kingdom holds plenty of surprises, especially that of Cleopatra! Spin three or more golden coins anywhere on the board and you will trigger a bonus round that will see you bringing even more Egyptian coins. The fearsome Asp symbol is also special, as it will trigger a number of free spins if you get it on selected reels. Join Cleopatra at the throne of ancient Egypt for a chance to spin in all of her golden coins. The ferocious Asp symbol acts as a scatter. If you spin three to five of these, you will be rewarded with up to 10, 20 or 100 free spins respectively. During free spins, prizes will be tripled. The golden Scarab acts as a wild symbol. It will replace all other symbols except scatters to help you create more winning lines. Spin two to five of these and you could win up to 5000 times your line bet. The golden coin acts as a bonus symbol. Spin three or more of these anywhere on the board and you will trigger a bonus feature. During this feature you will be taken to Cleo's secret chambers where you will need to break open urns to reveal your prize. The number of urns you get to break is dependant on how many coins you wager.